Built in response to the gold rush by George Richardson, this was originally called the Victoria Hotel. It is said to be the first brick building in BC. It would appear that this was a popular meeting place; meetings of the IOOF were held here in 1859, and of the Pioneer Cricketers in 1860. In the 1890s when a more grandiose “Victoria Hotel” was built elsewhere in Victoria, the name of this building was changed to the Windsor Hotel. In 1907, the streetcar travelled by the Windsor Hotel, John Emery tobacconist, and the Windsor Restaurant. Some time in the mid-twentieth century, the facade was given a “Tudor” treatment with stucco and black beams. In the 1970s, the tenants were Indian Craft Gift Shoppe and Scotty’s House of souvenirs. 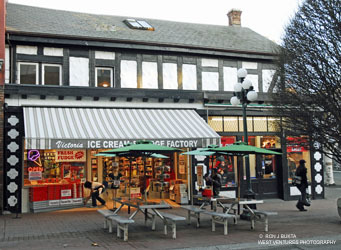 In 2009 we can see Save on Souvenirs and Victoria Ice Cream and Fudge Factory.